Or as low as $21.58 per month over 12 months. Apply Now. Control all your music & streaming services from the sonos app. Easy WiFi set up and allows you to expand your system over time. The Sonos PLAY 1 uses two state-of the-art digital amplifiers individually coupled with two speaker drivers to deliver great sound to any room. The wireless music system provides pure, clean sound that is perfect for bringing room filling music to a kitchen, bedroom, office, or just about any room in your home. 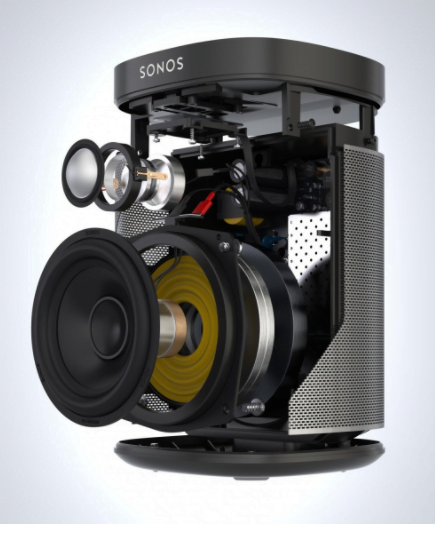 One mid-woofer in the Sonos PLAY 1 ensures the faithful reproduction of mid-range frequencies crucial for accurate playback of vocals and instruments, while also delivering a deep, rich bass. Turn two Sonos PLAY 1’s into separate left and right channel speakers to create wider, bigger, and deeper sound. Add two Sonos PLAY 1 speakers to PLAYBAR and SUB for a true surround sound experience. Trueplay measures the acoustics in any room – analyzing things like size, layout and furnishings. 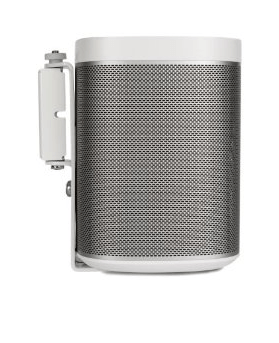 Then fine-tunes your Sonos PLAY 1 to make the music sound great, no matter where you place your speaker.